Never have we been so surrounded by other families traveling in Southeast Asia. This came as a big surprise. 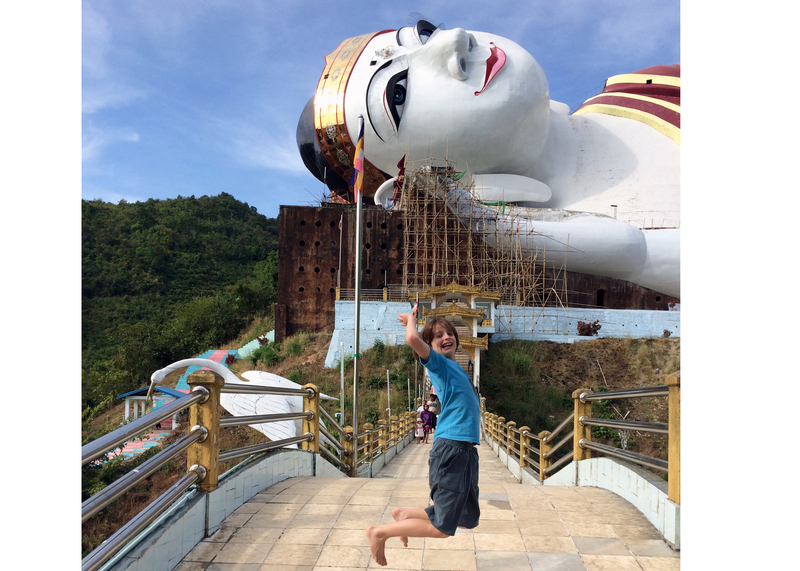 Taking our kids to Myanmar seemed a bit adventurous. We thought we were ahead of the curve, well, we weren’t, not at all. We saw tons of French kids running around but we also heard plenty of English, Italian, Dutch and German speakers. 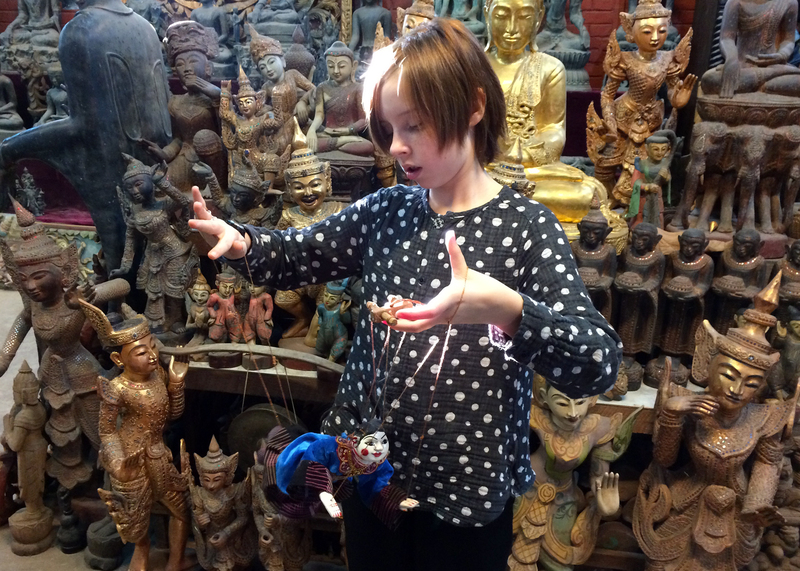 As we went through the Leap & Hop draft book of Myanmar with the “guinea pigs” we were amazed at how many fun things there were to do in addition to temple-hoping. In no particular order, here are the top 11 things on the kids’ list. 1. Lunch time for monks of all ages. In Myanmar, the last meal of the day for a monk is at 12. No solid food after that until breakfast. 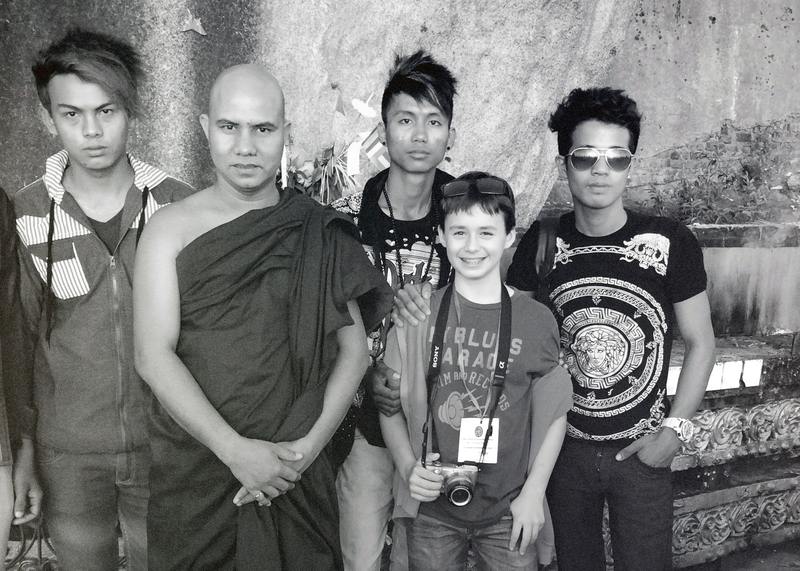 All buddhist men in Myanmar have to spend some time as monks. It doesn’t have to be long, sometimes not more than one week and boys can enter a monastery as young as 8 or 9 years old. They can be joined in their stay by their father and brothers and school vacations seem to be a good time. What are you doing for Spring break? 2. Posing for pictures with local people. When traveling in Asia, three fair-headed kids will constantly be asked to pose for pictures and ours have grown to hate it over the years. Somehow, this was not the case in Myanmar, as they turned out to be pretty cooperative with selfie-craving Burmese. Even our 12 year old was game for putting on a smile for the camera! 3. Kayaking in the rice fields in Kayin state at sunset. It was a magical day that ranked way up there on our list (grownups included). 4. Getting close to the monkeys in the cave temple of Ka Goon. 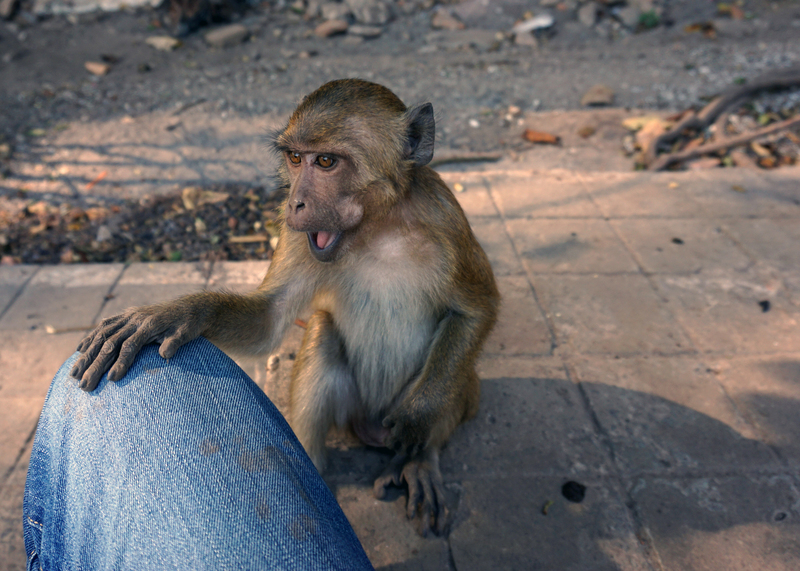 As much as they look cute and cuddly, you shouldn’t touch them. What to do when they are the ones coming to you? Hold your breath and take a quick picture. 5. Going on a scavenger hunt in the temples. Temple-hopping remains an all time favorite as long as there is something fun to do other than admire the architecture and carvings. 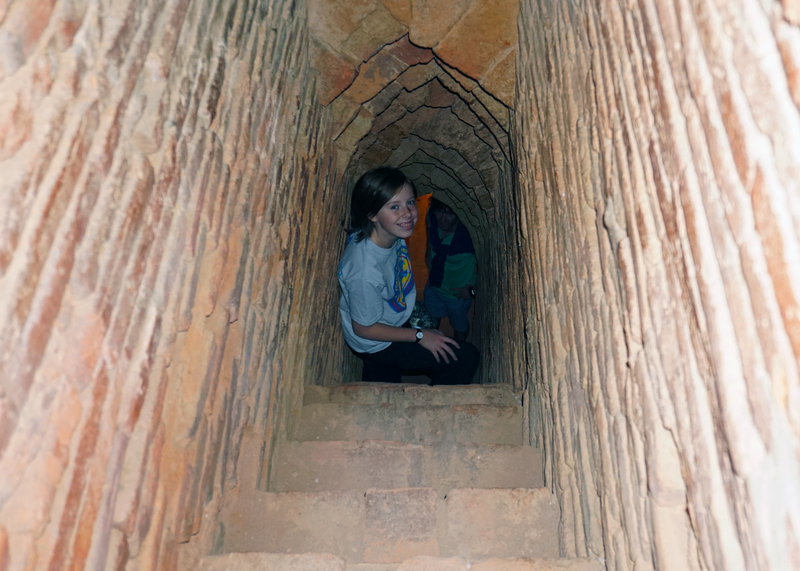 Exploring a “secret” passage in search of a hidden buddha is a good start. 6. 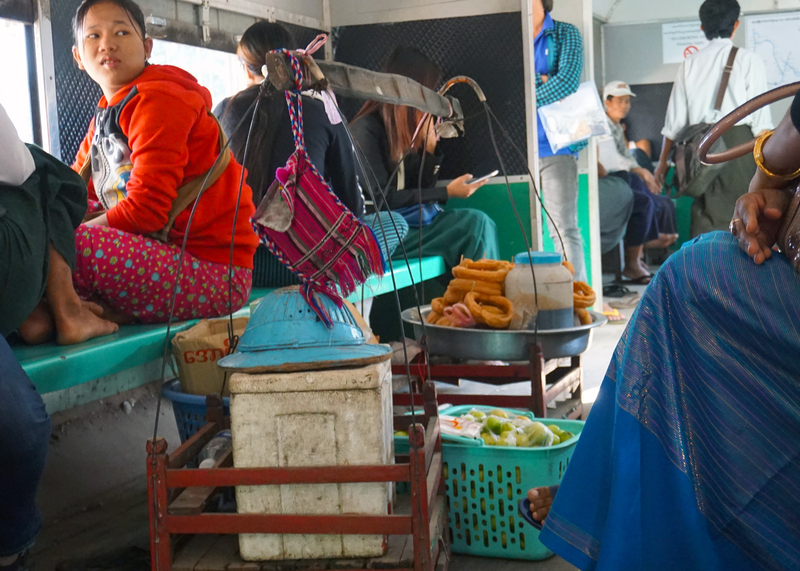 Riding the circular train in Yangon with local commuters. Traffic in Yangon is very congested, commuters use the circular train. The whole loop takes three hours. We shared their ride for 45 minutes and the kids enjoyed every minute of it. Between watching people selling food in the train, and looking through the window at the ever changing scenery, the kids were totally engaged. 7. Riding horse carriages are always great fun for kids. In Sagaing, Marcel was the one holding the reins. Yee-haw! 8. Local workshops. Everywhere in Myanmar you’ll find little workshops making and selling all sorts of goods and crafts: flattening gold leaves for the temples, puppets for tourists, weaving textiles for longyis, and leather flip-flops for monks. 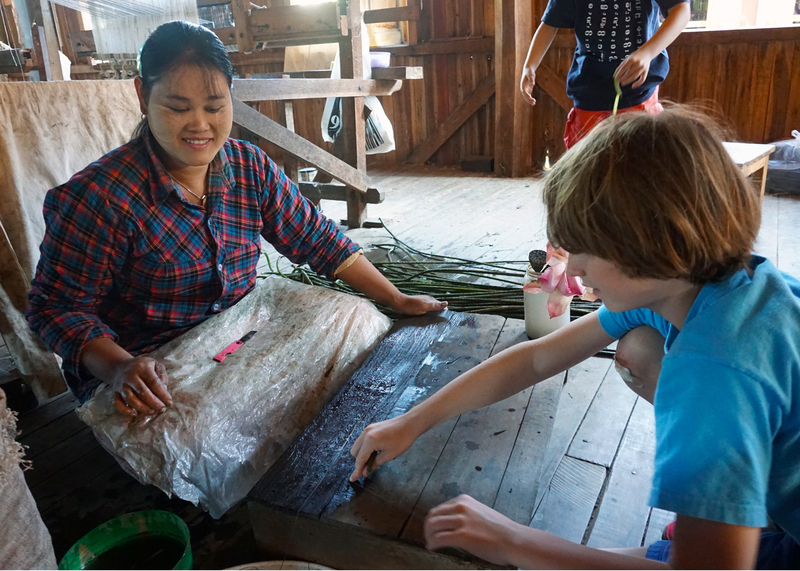 Among the favorites were the lotus fibre weaving workshops on Inle Lake and puppet stores in Mandalay. 9. 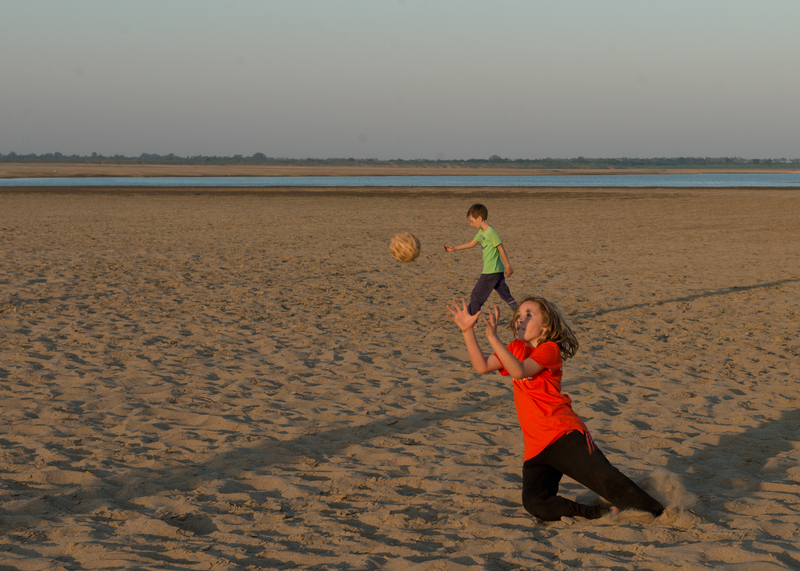 Sunset cruise and ball game on a sandbank in Bagan. Sunset is a big thing in Myanmar as the sites are truly gorgeous but after three such “amazing” sunsets that cannot be missed, the kids started to lose interest. In Bagan, the light came back on when the sunset cruise was paired with a game of dodgeball on a sandbank in the middle of the river. 10. 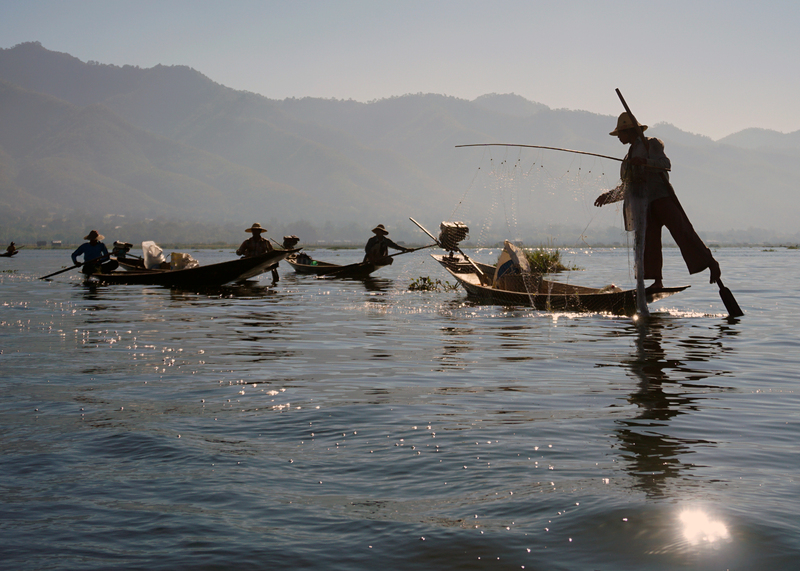 Boat rides on Inle Lake. The children were very impressed by fishermen paddling with one leg. How long does it take to master this skill? And how about growing vegetable on floating gardens on stilts? Quite a different and unique lifestyle for the kids to discover. 11. 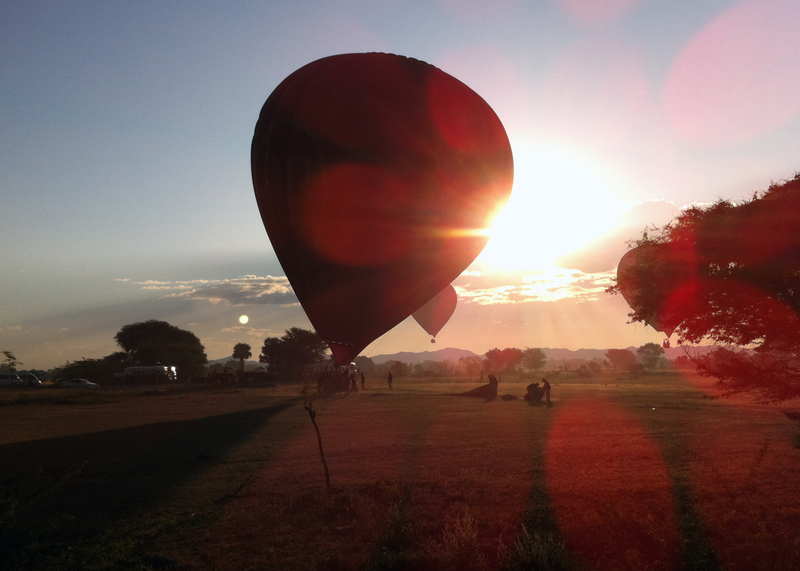 Watching hot air balloons in Bagan. Although we didn’t go on the balloons ourselves (you need to book months in advance if you are going over Christmas), the kids enjoyed seeing the balloons taking off above the pagodas at sunrise. Next time, we will get on, it’s a promise! Is it an expensive trip ? Can we travel around and explore the temples freely ? Thanks 🙂 right now the demand is huge and the infrastructure is in catch up mode so its not a cheap vacation compared to a similar trip in Thailand or Cambodia for instance. However, we saw quite a lot of backpackers with children, so it can be done. Also there is a big difference in price depending on whether you go in the high (roughly november through february) or low season. 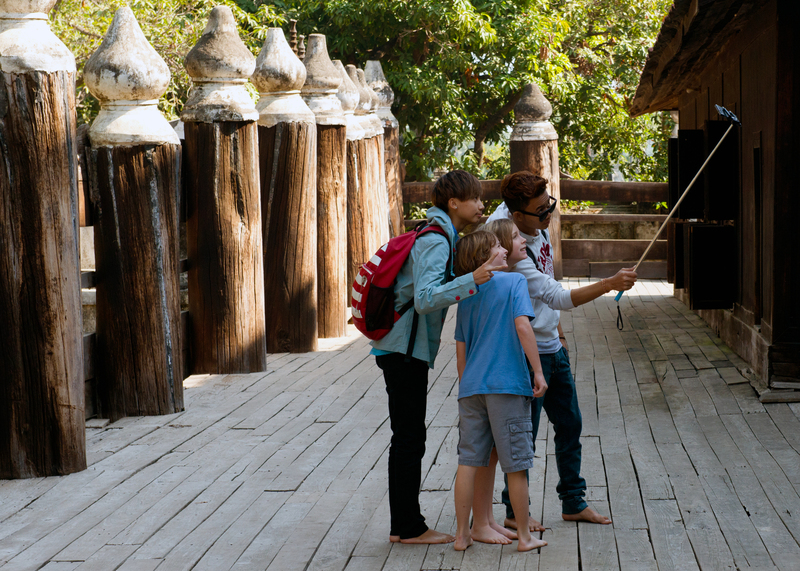 With respect to the temples, yes, you can let your kids loose to run around while you explore the grounds. It’s totally safe and open. You might have to pay entrance fees in skme places but it’s not much. It’s really an amazing trip! 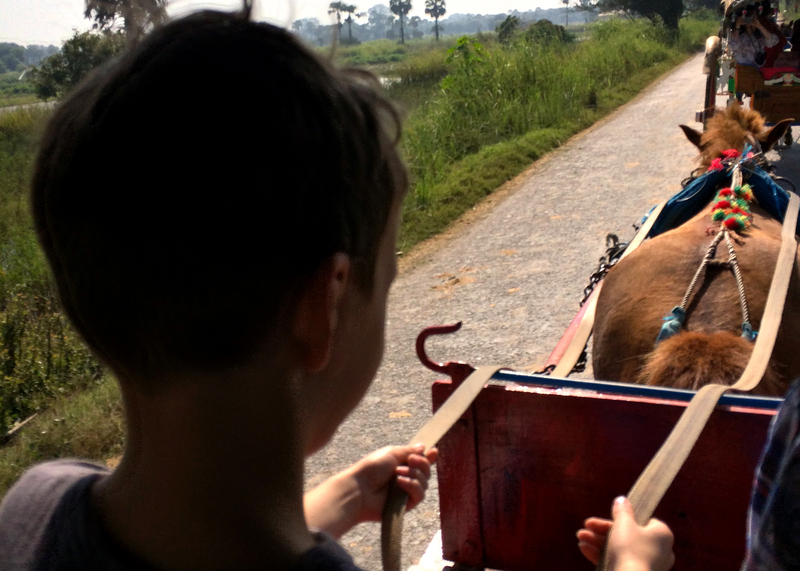 My kids just reminded me that i forgot a memorable bicycle ride in Inle and the Burmese cat sanctuary also in Inle. So that makes 13! Great photos and captions, Isabelle.